If you are unsure which options to choose, the default 680uh Tap 470uh, Ceramic Earphone and MK484 Radio IC is the standard build. 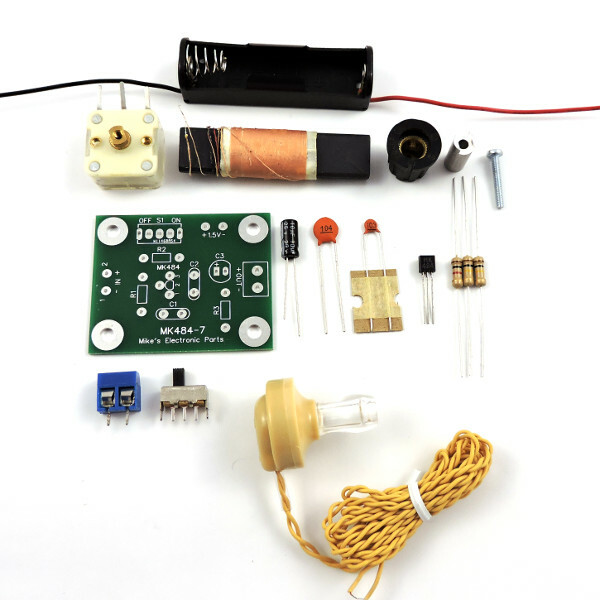 The MK484 AM Radio Kit 7 is a simple AM broadcast band receiver kit designed for the MK484 radio IC. This kit is not a beginners kit. MK484 Radio Kit 7 does require soldering and the ability to read a schematic. The kit is designed to allow a modular radio build. The RF tuning section is left off board to accommodate a variety of coil and capacitor combinations. The audio output can be connected directly to a high impedance earphone or headphone. 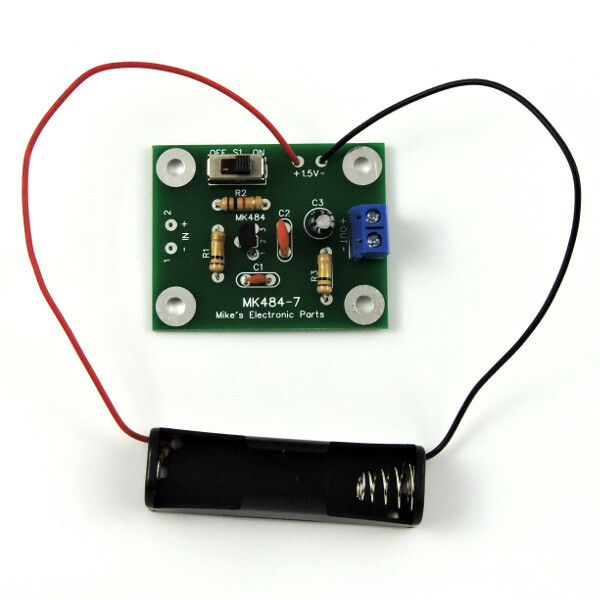 We have tested this kit with magnetic and piezoelectric headsets 2,000 Ohms and higher with good results. The audio output could also be fed directly to an audio amplifier. The circuit board is approximately 2″ by 1 5/8″. The mounting holes are sized for #6 screws. Ideal when not using an antenna or when you intend to inductively couple the antenna. Although an antenna is not required, the tap is ideal for use with an antenna. Multiple taps to allow some experimentation. The coil has one tap 10 turns from the end and one at the center. Can be used with or without an antenna. 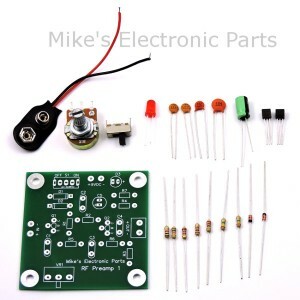 The MK484 Kit is a TRF ( Tuned Radio Frequency, Tuned RF ) type receiver. This the most basic type of radio receiver with no regeneration or re-genitive feedback. 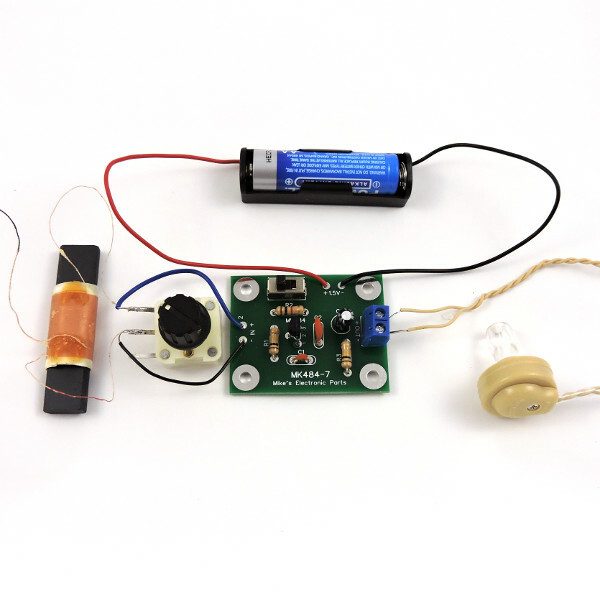 The variable capacitor and antenna coil form a “Tank” circuit that tunes the radio stations frequency then the MK484 amplifies the radio stations radio frequency then “Rectifies” (Converts to Audio) it then amplifies the audio and powers the Earphone. The MK484 family of radio integrated circuits are based off the ZN414 from the 1970s. There have been several manufactures of replacement integrated circuits for the ZN414. The default radio IC included with the kit is an original MK484, not a TA7642 as seen in many other kits. We currently supply several alternate MK484 radio integrated circuits. Any of these can be substituted in the circuit for the MK484. From our testing and customer feedback, the KM484 (not MK484) has the highest overall gain. However, it tends to fall into oscillation easily. The CD7642, TA7642, UTC7642, and YS414 have a gain just below the MK484. Feel free to comment in the discussions below to let us and others know your testing results and opinions of the different AM radio integrated circuits. 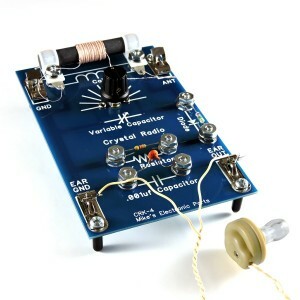 Could a different Loopstick and Variable Capacitor combination be used with this kit to receive a Short Wave Band(s)? 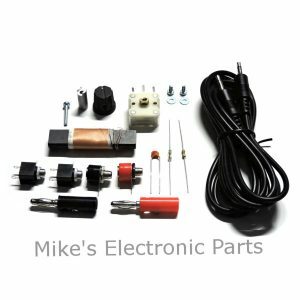 I a specifically curious about using the current parts that you stock. The MK-484 should work up to about 3 MHz. I believe it also only tunes AM signals, so no SSB. Within those parameters, there are a couple of things you can try. With the 680/470 coil, try using the 470 uh tap location rather than the full length of the coil. You can also slide the coil slowly off the end of the ferrite rod to increase the tuned frequency. Thanks, Mike. I am using that coil and will give your suggestions a try. This site and your products are great. Copyright © 2016 Mike's Electronic Parts, LLC. All Rights Reserved.